"Sharknado" Well played, Syfy. You used our obsession with former '90s stars and our obsession with potentially seeing them gobbled up by your various Frankenbeasts to woo us into an obsession with "Sharknado," talking about "Sharknado" on Twitter, talking about talking about "Sharknado" on Twitter, believing the employability of Tara Reid, actually paying to see the TV movie in a movie theater, and then obsessing about what the "Sharknado" sequel should be called. You sneaky, sneaky, motherfellas. P.S. 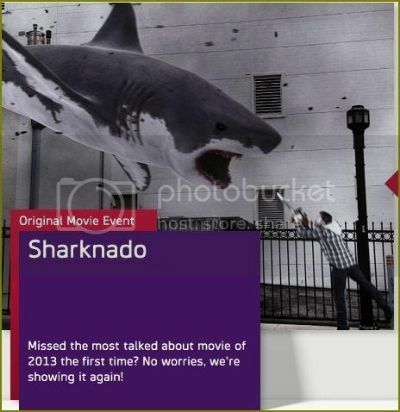 — "Sharknado 2: The Second One" … brilliant title. P.S.S. — John Heard … you were Peter McAllister's dad, you were on Tony Soprano's payroll, you were Tom Hanks's rival in "Big": Why "Sharknado"? Sharknado airs yet again (sigh) on Labor Day, Monday, September 2, 2013 at 9/8C on Syfy, during a day long Sharkathon. CLICK HERE TO VIEW THE SHARKATHON MOVIE MARATHON SCHEDULE ON SYFY.